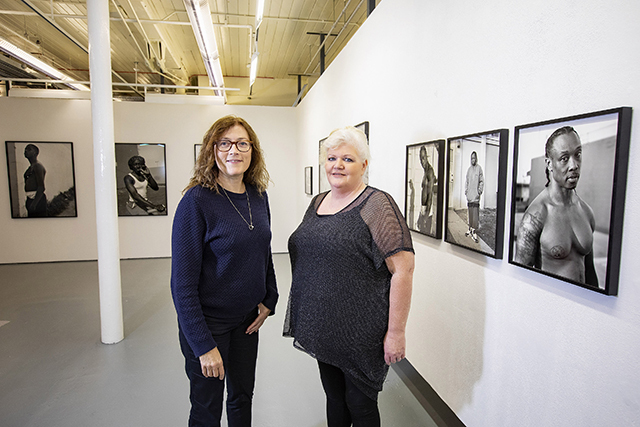 Image: Pictured is photographer, Dana Lixenberg, with Belfast Exposed Chief Executive, Deirdre Robb. Belfast Exposed is delighted to present Imperial Courts 1993-2015 by Dana Lixenberg, winner of the 20th Deutsche Börse Photography Foundation Prize (2017). This solo exhibition is the first showing of the award-winning photographer's work on the island of Ireland, supported by National Lottery funding through the Arts Council of Northern Ireland. In 1992, Dana Lixenberg was commissioned to document the areas of Los Angeles affected by the ‘Rodney King riots’, which erupted following the acquittal of four LAPD officers for the use of excessive force in the arrest of Rodney King. This visit inspired Lixenberg to return to LA and start her own project in 1993, which led her to the Imperial Courts housing project located in Watts, Los Angeles. In contrast to an often one-dimensional, sensationalized journalistic approach, Lixenberg employed a controlled and collaborative photographic approach, using the communal areas of Imperial Courts as her studio. She began to create large-format, black and white portraits of the residents, using natural light. These photographs, taken at a pivotal time in the history of the community, form the basis of her largest body of work to date. “The Arts Council of Northern Ireland, is pleased to support this contemporary photographic exhibition by award-winning artist, Dana Lixenberg, at Belfast Exposed. The impressive work spans 22 years presented across a range of platform and I would encourage everyone to go along”. “Dana Lixenberg has expertly captured a portrait of the Imperial Courts housing project creatively using photography to challenge stereotypical notions and empowered a community to have a direct voice and made visible issues ignored by society. There is a powerful drama to Lixenberg’s work that engages the audience to consider issues surrounding equality and representation”. Spanning 22 years (1993-2015), Imperial Courts subtly addresses issues of inequality and injustice while avoiding stereotypical representation. Using multiple platforms, from silver gelatin prints, a carefully edited publication, video installation, and an online web documentary, the project serves as an evocative record of the passage of time in an underserved community. The power of Lixenberg’s work can be found in the intimacy, compassion and quiet confidence of her images, and of the individuals we meet through the series.